To Cite: Grgic I, Planinic A, Santak M, Gorenec L, Lepej S Z, et al. High Prevalence of Q80K Among NS3 Resistance-Associated Substitutions in Subtype 1a Patients with Chronic Hepatitis C Prior to Treatment with Direct Acting Antivirals: The Croatian Data, Hepat Mon. 2017 ; 17(5):e45543. doi: 10.5812/hepatmon.45543. Background: Therapy for chronic hepatitis C is based on direct-acting antiviral drugs (DAA) that include protease inhibitors, polymerase inhibitors, as well as inhibitors of NS5A protein. Resistance-associated substitutions (RAS) can be associated with inadequate treatment outcomes with DAA. People with HCV subtype 1a infection carrying Q80K polymorphism could have a reduced treatment response to a protease inhibitor simeprevir. The data on the prevalence of Q80K polymorphism and other RAS worldwide are quite variable. Objectives: The study goal was to analyze the frequency of Q80K polymorphism and other substitutions associated with HCV resistance to NS3 inhibitors in patients previously not treated with simeprevir infected with HCV subtype 1a from Croatia. Methods: The study included 136 people with chronic hepatitis C and infected with HCV subtype 1a receiving clinical care at the department of viral hepatitis of the University hospital for infectious diseases, Zagreb and Croatian reference center for viral hepatitis from July 2015 to April 2016. All participants were not previously treated with simeprevir and not co-infected with HIV. Detection of Q80K polymorphism and other substitutions associated with resistance to NS3 inhibitors was performed by population-based sequencing on ABI PRISM® 3100 genetic analyzer. Phylogenetic tree was constructed using the Maximum Likelihood method and supported with a bootstrap test of 1000 replicates. Geno2Pheno algorithm was used for the interpretation of sequences, detection of resistance associated substitutions and determination of the clade of the sequence. Results: The prevalence of Q80K polymorphism was observed in 42.6% of patients while resistance to simeprevir (mediated by other RAS as well) was detected in 46.3% of patients. Phylogenetic analysis of subtype 1a sequences showed the separation into 2 clades and Q80K polymorphism was exclusively present in clade I isolates. Other RAS detected in the patients included V36L, T54S, V55A, S122R, and I170T. Conclusions: In conclusion, the prevalence of Q80K polymorphism was found to be rather high in patients with chronic hepatitis C infected with clade I subtype 1a while other substitutions associated with resistance to protease inhibitors were rarely found in Croatian cohort. The results of this study confirm the need for pre-treatment screening for Q80K in subtype 1a patients considered for simeprevir treatment. Hepatitis C virus (HCV) is an RNA virus that belongs to the family Flaviviridae. HCV displays a high level of genetic diversity and is currently divided into 7 genotypes that comprise 67 subtypes, 20 provisionally assigned subtypes as well as recombinant forms (1). Subtype 1a is separated into 2 distinct clades that show differences in development of resistance to antiviral drugs (2). Hepatitis C can cause a chronic liver disease, which represents a huge public health issue. State-of-the-art therapy of chronic hepatitis C is based on direct acting antiviral drugs (DAA) that include protease inhibitors, polymerase inhibitors, as well as inhibitors of NS5A protein (3). Individuals with HCV subtype 1a infection carrying Q80K polymorphism could have a reduced treatment response to a protease inhibitor simeprevir (4, 5). Based on the results of the QUEST trial, pre-treatment testing for the presence of resistance associated substitution Q80K in patients infected with subtype 1a is advised. Alternative therapeutic options for subtype 1a patients carrying Q80K have been recommended (5-7). Literature data on the prevalence of Q80K in Europe are quite diverse. Sarrazin et al. (2015) analyzed the prevalence of Q80K in 3 349 patients from 25 European countries enrolled in 14 telaprevir and simeprevir Phase IIb and III clinical trials. The overall prevalence of Q80K was 7.5% for genotype 1 isolates (19.8% for subtype 1a isolates and 0.5% for subtype 1b isolates) (8). National studies on the prevalence of Q80K in Europe are quite limited. The prevalence of Q80K substitution was 18.5% in subtype 1a infected individuals from United Kingdom analyzed by population-based sequencing (9). Data from Scotland shows 13.7% prevalence of Q80K in a cohort of 146 HCV genotype 1 patients whereas Irish cohort had a prevalence of 40.2% (10, 11). A cohort from Turin, Italy had a Q80K prevalence of 40% in subtype 1a isolates and a study from France showed that 10 of 95 patients carried Q80K substitution (12, 13). National data for Croatia’s neighboring countries are available only for Slovenia, with Q80K prevalence of 36.4% in subtype 1a isolates and 23.8% for genotype 1 in total (14). Croatia is a country with a population of 4 284 889 with the 0.9% prevalence of anti-HCV in individuals undergoing routine check-ups prior to surgical or medically-assisted reproduction procedures, 0.5% in pregnant women, and 0.1% in voluntary blood donors (15, 16). The highest burden of disease is attributed to polytransfused patients and plasma product recipients prior to 1992 (75.9%) as well as intravenous drug users (29% - 65%) (16). A 10-year retrospective national study on the molecular epidemiology of HCV infection that included 1,163 patients reported 58.8% of genotype 1 infections and 35.6% of genotype 3 infections (genotypes 2 and 4 were rare). According to this study, 13.1% of genotype 1 infections were attributed to subtype 1a (17). Treatment of chronic hepatitis C with DAAs including simeprevir has been available in Croatia since 2015 (18). Our research goal was to analyze the presence of Q80K polymorphism in patients with HCV subtype 1a infection prior to DAA treatment and other RAS associated with HCV resistance to NS3 inhibitors. The study included 136 people with chronic hepatitis C infected with HCV subtype 1a receiving clinical care at the department of viral hepatitis of the University hospital for infectious diseases, Zagreb and the Croatian reference center for viral hepatitis from July 2015 to April 2016. All participants were not previously treated with simeprevir and none of them were coinfected with HIV. Human DNA was extracted from the whole blood by using the Qiagen Blood Mini kit (Qiagen, Hilden, Germany). Detection of single nucleotide polymorphism (SNP) rs12979860 was determined by using the real-time polymerase chain reaction (PCR) test IL28B LightMix® Kit IL28B rs12979860 (TIB Molbiol, Berlin, Germany) and LightCycler® FastStart DNA Master HybProbe (Roche Diagnostic, Basel, Switzerland). HCV subtype was determined by using the VERSANT HCV Genotype 2.0 Assay LiPA (Siemens Healthcare GmbH, Erlangen, Germany). Sequencing of the NS3 region in 5 of the 136 patients, previously classified as genotype 1 or subtype 1b infections, showed misclassification of subtypes by the version 1 of Inno LipA that targeted only 1 region 5′UTR and was discontinued in 2008. Detection of Q80K and other substitutions associated with resistance to NS3 inhibitors was performed as a part of the pre-treatment diagnostic workup by population-based sequencing. Viral RNA was extracted by using the QIAamp viral RNA Mini Kit (Qiagen, Hilden, Germany) from patients’ sera samples. PCR with reverse transcription was performed using the SuperScriptTM III One-Step RT-PCR System with Platinum® Taq High Fidelity (Invitrogen, Carlsbad, USA) kit with primers: HCV07: CTTYTCCCRRATGGAGACC and HCV08: TGTYCTCACCCCRGTCCT. Nested PCR was performed using the FastStart High Fidelity PCR System dNTPack (Roche Diagnostics, Basel, Switzerland) kit with primers: HCV12: GACATCATCAACGGCTTGC and HCV13: CGGGACCTTGGTGCTCTT. Population-based sequencing was performed by using the BigDyeTerminator v3.1 Cycle Sequencing Kit (Applied Biosystems, Foster City, USA) on ABI PRISM® 3100 Genetic Analyzer (Applied Biosystems, Foster City, USA). All fragments were sequenced in both directions with primers 12 and 13 as mentioned above. The nucleotide sequence of NS3 gene in the region 3412 and 3956 nts (HCV-1a/US/BID-V411/2003 (EU155311) gene were aligned together with sequences of isolates from the GenBank under accession numbers EU155378 (BID-V26), EU482832 (BID-V33), EU256022 (BID-V65), EU234063 (BID-V177), EU255950 (BID-V241), EU155311 (BID-V411), KP411630 (c133614), JN704241 (c132660), JN704229 (c132638), JN704242 (c132661), KP411642 (c133577), KP411634 (c133707), JN704218 (c132626), JN704232 (c132650), JN704202 (c128347), KP411694 (D10601), KP411616 (c133713, KP411618 (c133532), and KP411699 (D10653) using the MEGA 7.0 software (www.megasoftware.net) (19). Sequences from the GenBank were 9 randomly selected sequences belonging to clade 1 and 10 randomly selected sequences belonging to clade 2 as published in paper by Picket et al., 2011 (2). A phylogenetic tree was constructed using the Maximum Likelihood method and supported with a bootstrap test of 1,000 replicates. Geno2Pheno algorithm was used for the interpretation of sequences, detection of resistance associated substitutions, and determination of the clade of the sequence. Genotype and subtype were additionally confirmed using BioAfrica-Oxford HCV Subtyping Tool. All sequences were submitted to the GenBank with accession numbers from KX405026 through KX405161. The median age of 136 HCV-infected patients (73.5% males, 26.5% females) included in this study was 46 years. The majority of patients included in the study were intravenous drug users (63.2%), followed by transfusion recipients (18.8%) and patients with possible sexual transmission of HCV (2.6%). The data on HCV transmission route were not available for 18.4% of patients. The median viral load from the sample used for sequencing was 5.728 log10 IU/mL. Fibrosis stage F1 was detected in 23.7% of the patients, F2 in 26.3%, as well as F3, and F4 in 23.7%. Patients were previously treated with pegylated interferon alpha (PEG IFN-α), ribavirin (42.1%), as well as a combination of PEG IFN-α, ribavirin, and boceprevir/telaprevir (7.9%) (Table 1). IL-28B polymorphism analysis showed equal percentages of C and T homozygotes (19.5%) with 61% of heterozygotes (Table 1). The prevalence of Q80K polymorphism in HCV subtype 1a infected individuals from Croatia was 42.6% (58/136). According to Geno2Pheno algorithm, clade I of HCV subtype 1a was assigned to 72 (52.9%) sequences and clade II to 64 (47.1%). Q80K polymorphism was detected in 58/72 (80.6%) patients infected with clade I while no patients infected with clade II carried that substitution. Other substitutions associated with NS3 resistance were R155T, which is (responsible for resistance to boceprevir, simeprevir and telaprevir, according to Geno2Pheno algorithm) detected in 3 clade II infected individuals, and V36L (responsible for possible resistance to asunaprevir, simeprevir, and telaprevir, and resistance to boceprevir according to Geno2Pheno algorithm) in 2 individuals. In clade I patients, other resistance associated substitutions were only found in combination with Q80K (V36L in 2 patients and S122R and I170T in 2 separate patients). Resistance to simeprevir was detected in 63 (46.3%) subtype 1a isolates from the Croatian cohort. Q80K was the most frequent RAS in this cohort. Substitution responsible for possible resistance to previously used DAA telaprevir, N174S, was found in 54 patients, and substitution, N174G that doesn’t cause resistance in 61 patients. Other substitutions that cause resistances to NS3 inhibitors were T54S and V55A, however, they confer resistance to DAA that are no longer used (resistance to boceprevir and possible resistance to telaprevir), each found in 4 different patients. Substitution Q80L was found in 3 clade I infected patients. Other substitutions not associated with clinically significant resistance found in this cohort were Q41H, V55I, R117C, R117S, S122G, S122N, R155S, D168P, and I170V. Therefore, a total of 6 patients were infected with viruses harboring Q80K in combination with other RAVs; 1 patient carrying S122R, 1 patient carrying I170T, 2 patients carrying V36L, 1 patient carrying T54S, and 1 patient carrying V55A. Eight patients infected with clade I and 1 patient infected with clade II carried no substitutions (Table 2). The phylogenetic tree shows clear separation of the 2 clades, with 6 sequences from GenBank (3 for each clade) located within the clade assigned (Figure 1). Regions of the HCV genome, targeted by the DAA, NS3, NS5A, and NS5B, harbor RAS in different frequencies, even in therapy-naive patients. However, RAS’s can also occur under selective pressure of antiviral drugs (4). Natural polymorphism Q80K, responsible for reduced susceptibility of HCV to protease inhibitor simeprevir, is the most thoroughly studied RAS. The frequency of Q80K in different HCV genotypes and subtypes is quite variable (4, 5). It is most commonly found in subtype 1a infections but has also been detected in HCV subtype 1b as well as genotypes 5 and 6 (20, 21). The prevalence of this substitution is diverse in different geographic areas (4, 8). This study determined the prevalence of Q80K polymorphism in the cohort of patients infected with HCV subtype 1a from Croatia. According to Sarrazin et al. (2015), the average prevalence of Q80K polymorphism in subtype 1a isolates from Europe was 19.8%. Country specific data on Q80K prevalence in 1a subtype was available for 15 countries and showed a high degree of variability ranging from 4.8% in Norway (n = 21 sequences) up to 75% in Poland (n = 20 sequences). According to our study, the prevalence of Q80K in Croatian subtype 1a infected patients was 42.6% and was much higher compared to 14 of the 15 countries analyzed by Sarrazin et al. (except Poland). Observed differences can in part be explained by different numbers of subtype 1a sequences from individual countries analyzed by Sarrazin et al. (6 sequences from Russia up to 275 sequences in France) (8). Lawitz et al. (2016) analyzed the effect of baseline Q80K polymorphism in treatment-naive and treatment-experienced patients with HCV genotype 1 and cirrhosis treated with a combination of simeprevir and sofosbuvir in an OPTIMIST-2 clinical trial. Their results have shown significantly lower SVR 12 rates in subtype 1a patients with baseline Q80K polymorphism compared with patients without this substitution (74% vs. 92%). Based on these results, it has been suggested that the negative effect of Q80K might be more important in the presence of other negative predictors of treatment success (22). Subtype 1a Q80K-positive patients from Croatia have been excluded from all simeprevir-containing treatment options and the effect of this polymorphism on simeprevir treatment in real-life context could not be evaluated. Q80K is associated with reduced treatment effect on only 1 additional protease inhibitor (asunaprevir), which is not used in Croatia. Therefore, we can conclude that the most important consequences of Q80K detection was the change in the selection of therapeutic regimen and deferral of treatment for Q80K-positive patients until 2016 when other IFN-based therapeutic options became available. The data on the Q80K prevalence in neighboring countries are limited with exception of Slovenia. With the prevalence of Q80K polymorphism in subtype 1a isolates of 36.4%, their findings are similar to our results (14). National studies are limited for the rest of the European countries as well. In the Irish cohort, the patients were divided in 2 groups: patients at baseline (n = 164) and patients at viral breakthrough (n = 18). Subtype 1a predominated in both patient groups with 65.2% and 77.8%, respectively. Different resistance substitutions were identified in 57.3% of subtype 1a isolates and Q80K was found in 40.2% of subtype 1a isolates from Ireland, exclusively in clade I. RAS, other than Q80K, detected in the cohort included V36L, T54S, V55A, and I132V and where consistent with RAS observed in the Croatian cohort (11). Beloukas et al. (2015) compared 238 sequences obtained by population-based sequencing and 178 sequences additionally obtained by next generation sequencing to determine the prevalence of Q80K polymorphism among therapy-naive HCV subtype 1a infected individuals from United Kingdom. Results were similar for both methods, 18.5% prevalence was observed by Sanger sequencing and 15.7% by deep sequencing. HIV coinfection had no major influence on the prevalence of Q80K polymorphism. Phylogenetic analysis confirmed the existence of 2 separate 1a clades, 1 carrying Q80K polymorphism and the other without it (9). The Dutch study on the prevalence of RAS in NS3 region of HCV genome included 148 subtype 1a infected individuals. Study groups were determined by the patient’s HIV status (68 patients were coinfected with HIV). Resistance patterns in the 2 groups were different with the HIV/HCV coinfected group having lower overall prevalence of resistance compared with the HCV group, 62% and 79%, respectively. On the contrary, the prevalence of Q80K polymorphism was higher in the group with HIV coinfection, 50% vs. 24% (23). The Scottish cohort consisted of 146 patients infected with HCV genotype 1 (140 with subtype 1a and 6 with subtype 1b). The prevalence of Q80K polymorphism was 13.7%. Similar to our results, other detected RAS responsible for reduced susceptibility to simeprevir included V36M, V36L, T54S, V55A, and I170A (10). The study on 205 HCV genotype 1-infected individuals from Turin region in Italy detected RAS in 27.3% with Q80K being the most prevalent substitution (40% of detected RAVs) and found only in subtype 1a isolates (12). Morel et al. analyzed 95 subtype 1a-infected individuals from Amiens, France for the presence of Q80K polymorphism, which was detected in 10 (10.5%) isolates (13). Vidal et al. (2015) included 11 140 (3,082 eligible for analysis) NS3 protease sequences from Los Alamos and GenBank in a study of worldwide distribution of Q80K polymorphism in genotype 1 isolates. There were no sequences from Central America countries, while South America was only represented with sequences from Brazil. The continent with the highest prevalence of Q80K polymorphism was North America (30.4%), followed by Europe (6.1%), Oceania (4.7%), Africa (3.7%), and prevalence under 2% was measured in Asia and Brazil (representing South America). The prevalence of Q80K varied depending on the distribution of subtypes 1a and 1b, being higher in countries with more 1a isolates, with exception of France where the prevalence was similar for both subtypes (7.9% for 1a and 6.1% for 1b) (24). The only African country with a national study on the prevalence of RAS in HCV genotype 1 chronically- infected individuals is Tunisia. The majority of isolates included in this study belonged to subtype 1b (142/149). Twelve sequences harbored a single RAS in the NS3 region. No multiple substitutions were detected. Q80K and T54S substitutions were present in 4 isolates, while V56A was found in 2 and R155K and A156V in 1 isolate (25). Subtype 1a is segregated in 2 distinct clades with different substitution patterns: clade I, where Q80K substitution is detected, and clade II, without this particular substitution. McCloskey et al. (2015) analyzed 677 HCV subtype 1a NS3 region sequences and concluded that the most recent common ancestor of the 2 clades dates to early 1940s. The substitution event took place in the United States of America. The majority of HCV isolates with Q80K substitution (96%) originated from the same lineage, which indicates that this substitution is highly transmissible (26). A study by De Luca et al. included 362 subtype 1a sequences originating from Italy, Germany, France, Spain, Brazil, Egypt, Australia, Japan, and United States. Phylogenetic analysis showed clear separation of sequences in 2 clades, with clade I being more frequent in non-European samples, 75.7% and 49.3%, respectively. The prevalence of Q80K substitution was 51.6% for clade I isolates and was completely absent from clade II isolates. De Luca et al. estimated that the separation of the 2 clades occurred around the year 1964 (27). Other authors like Beloukas, Lieveld, and Lunar also report detecting Q80K substitution exclusively in clade I isolates (9, 14, 23). Santos et al. proposed the separation of clade I into 3 subclades, A, B, and C. A total of 1 140 sequences were eligible for an analysis, 363 from Europe, 573 from North America, 110 from Brazil, and 94 from Oceania. This study showed that sequences belonging to different subclades are geographically segregated, with subclade IA as a prevalent subclade in North America and IC in Brazil. Q80K substitution was linked to subclade IA while almost completely absent from IB and IC, which explains high geographic difference in the prevalence of Q80K. 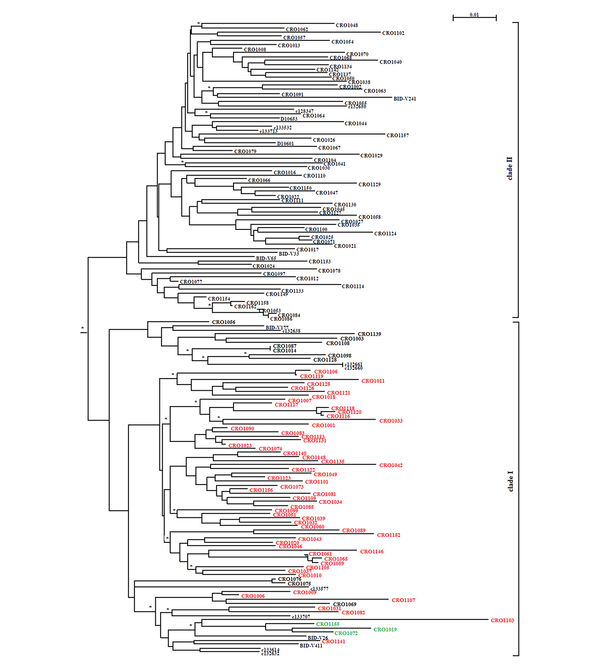 Our phylogenetic analysis shows similar clustering (28). The prevalence of Q80K substitution was found to be rather high in patients with chronic hepatitis C infected with clade I subtype 1a while other substitutions associated with resistance to protease inhibitors were rarely found in the Croatian cohort. The results of this study confirm the need for pre-treatment screening for Q80K in subtype 1a patients considered for simeprevir treatment. Ethical Approval: Ethics committee of the UHID approved the study and all subjects signed an informed consent form. Funding/Support: This study was in part supported by the Croatian Science Foundation project titled “Infectomics Study of Human Liver Non-parenchymal Cells in Chronic hepatitis C” (principal investigator Professor Adriana Vince, project number IP-11-2013) as well as by the Center of Excellence in Viral Immunology and Vaccines. 6. The European Association for the Study of the Liver . EASL recommendations on treatment of hepatitis C .
7. AASLD-IDSA . Recommendations for testing, managing, and treating hepatitis C.
14. A high prevalence of Q80K mutation among patients chronically infected with genotype 1 hepatits C virusdue to concurrent circulation of clade I and clade II subtype 1a in Slovenia. ECCMID 2016. 18. Croatian reference center for diagnostic and treatment of viral hepatitis: Recomedations for treatment of hepatitis C 2015 .